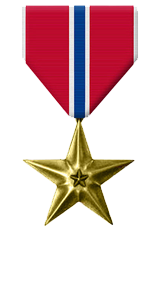 For heroic achievement in connection with combat operations involving conflict with an opposing force while serving as Company Commander, Company I, 3d Battalion, 3d Marines, Regimental Combat Team- 7, I Marine Expeditionary Force Forward, from 25 March 2006 to 1 September 2006, in support of Operation IRAQI FREEDOM. Through devotion to duty and exceptional tactical abilities, Captain Lynch significantly contributed to the primary mission of developing competent and capable Iraqi Security Forces. Upon arrival to Iraq, the partnered Iraqi Army Company assigned to his company was incapable of conducting squad-sized operations. Captain Lynch quickly assessed the Iraqi Army Company’s capabilities, integrated them into operations, developed solid professional relationships, and implemented a comprehensive training plan that proved instrumental to their progressing to the point where they routinely conducted independent company-sized operations. He also successfully introduced a seed Iraqi Police force to Haditha. During the deployment, the Marines of Company I operated under continuous harassing attacks from a determined enemy. Captain Lynch was present at many of these attacks and displayed an unsurpassed level of stamina, poise and courage as he directed the actions of his Marines, often exposed to direct and indirect fire himself. During each of these engagements he led from the front and provided a source of inspiration and motivation to his Marines. By his zealous initiative, courageous actions, and exceptional dedication to duty, Captain Lynch reflected great credit upon himself and upheld the highest traditions of the Marine Corps and the United States Naval Service.